Achieving a healthy, green lawn requires more than just the occasional mowing. Fertilization is essential for a well-nourished, lush lawn. If your lawn is in need of some attention, trust our fertilizing lawn specialists to help your lawn grow to its fullest potential. Our team is knowledgeable and knows what equipment and products you’ll need to achieve a stunning yard. Be the envy of your neighbors with a professionally fertilized and maintained lawn. Our Knoxville Landscaping Company fertilizing experts understand the benefits of each type of mixture, and know how to match each product up to each individual lawn for excellent results every time. Lawn fertilizer is made up of three primary nutrients, including potassium, nitrogen, and phosphorus. 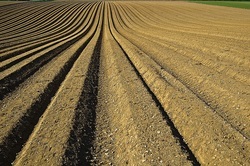 Potassium promotes better resistance to drought and disease, while nitrogen encourages grass to grow faster and greener. Phosphorus helps to stimulate seedling development and deeper root growth. Each type of fertilizer has the amount of each of these primary nutrients on the package. Our team will also determine how much fertilizer to use based on the square footage of your yard and the nutritional needs of your turf. In addition to what type and how much fertilizer to use, you’ll also need to fertilize your lawn on a proper schedule. The timing of fertilization treatments is important if you’re looking to achieve a green, thriving lawn. To determine when to fertilize your yard, you must take into account the release rate of nitrogen to ensure that your yard receives a constant supply of nitrogen. Our Knoxville Landscaping Company team can do all your fertilization so you don't have to worry about it! Fertilizer has numerous benefits for your lawn, starting with its rich nutrient content. In many cases, grass can suffer if there is not enough nutrients in the soil. Soil that is lacking nutrients can result in brown grass, bare or thin patches, or grass that is highly susceptible to insect infestations and disease. Without fertilization, grass is unlikely to grow full, lush, and green. However, it’s important to know exactly how much fertilizer to use to achieve optimal results. When too much fertilizer is used, thatch can buildup which harbors large populations of insects and other disease-carrying organisms. On the other end of the spectrum, too much fertilizer can have a negative environmental impact, causing possible aquatic and algae plants to grow due to runoff. Our fertilizing experts use a slow-release product to ensure that your lawn gets the nutrients it needs consistently over a period of time, which reduces the risk of disease, infestation, and thatch buildup. Late summer to mid-autumn is the best time to seed grass. During this time, there is less interference from weeds, the soil is warm due to seasonal conditions, and there is more moisture in the soil due to increased rainfall. This provides the perfect environment for new grass seeds to germinate. While seeding your yard may seem like a straightforward job, there is more to seeding than simply throwing handfuls of seeds from a bag. To ensure optimal, even growth across your yard, you’ll want the skill and knowledge of Knoxville Landscaping Company. Before applying seed to your turf, we’ll first check to ensure that the soil is in optimal condition. Most turf grasses require neutral soils to thrive. Our lawn care professionals can test your soil for you to ensure that it’s an adequate growing environment. Before seeding, you’ll also want to apply any fertilizers or organic compounds, especially if the soil is dry or low in vital nutrients. When you choose Knoxville Landscaping Company you can be sure that your lawn will properly seeded for optimal growth and health. Our lawn care team has the equipment to ensure that the new grass seed is placed directly into the soil, which eliminates the need to strip or till. We will also use a premium seed blend that is custom selected for your unique lawn to give your property the best results possible. In favorable planting conditions, most types of grass seed will germinate within 14 days of planting. To ensure that your new grass thrives, it’s crucial to water your newly seeded lawn frequently. Newly seeded lawns should be watered at least once per day to keep the seeded areas moist. Mulch may be spread over the seeds to maintain a high level of moisture and promote better growth. Over-seeding may also be recommended if you would like your lawn more lush and green. Seeding is an excellent way to fix bare spots, fill out thinner areas, or repair or renovate your average-looking lawn. There are numerous advantages to seeding over other alternatives like sodding, including more grass varieties to choose from, its more cost-friendly, and it creates stronger root systems. For more information about seeding or any of our other lawn care services, call Knoxville Landscaping Company today.